Sunday September 29th 1878 I did not feel very well and did not go to church. Rob & Hatt were invited to take dinner at Wins. I went down to Robinsons late in the afternoon and did not get hoe till supper was nearly ready. I began a letter to Florence Work in the afternoon and I finished it up in the evening. Weather rather pleasant. 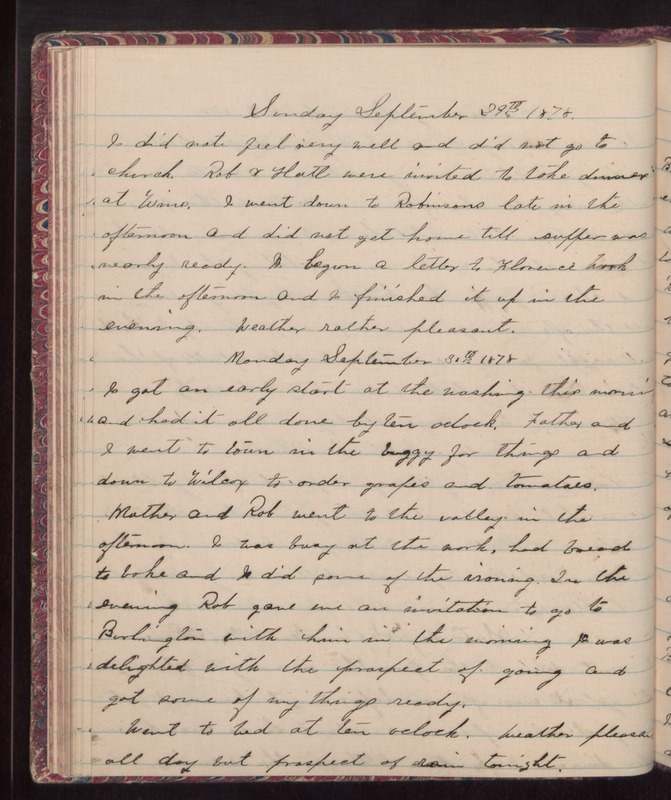 Monday September 30th 1878 I got an early start at the washing this morning and had it all done by ten oclock. Father and I went to town in the buggy for things and down to Wilcox to order grapes and tomatoes. Mother and Rob went to the valley in the afternoon. I was busy at the work, had bread to bake and I did some of the ironing. In the evening Rob gave me an invitation to go to Burlington with him in the morning . I was delighted with the prospect of going and got some of my things ready. Went to bed at ten oclock. Weather pleasant all day but prospect of rain tonight.